Ooh, this is a bit nice for a Wednesday. Sun's out, windows wound down (more of that later) and we're faced with a nicely embossed menu that whispers "design" in your ear, with its grey/black lettering and not an upper case letter in site. 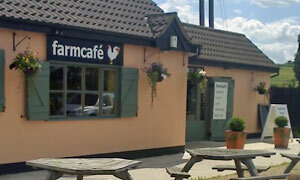 This, my friends, is the nationally acclaimed (a) hip and (b) happening farmcafe & foodmarket, sitting fair square on the A12 at Marlesford. Dig those omitted spaces. Deliberation done, mine's the hot baguette with "hot roast free range chicken breast" and stuffing. Mighty fine and top time to try out a dash of French dressing, then a splash of spicy ketchup. There's veggy crisps and leafy stuff on the side, though the stuffing sausagettes carried my scatological mind to The Story Of The Little Mole. Plop, plop. Talking of which, it's a fine thing to sit and watch the cows through the non-existent glass windows. Moo. I was going to say that. All through savouries, Andy's cream tea has been sitting there, teasingly. That's a Giant Haystacks of a scone, enough to provide summat sweet for all three of us. Service is ever so slightly haughty, IMHO, but my excellent Americano somewhat diminished that opinion. Highly (re)commended. If it was a car -- Jaguar XK. If they were passing by -- Ruthie Henshall.